These are just stunning! You really paint with your camera 🙂 Bravo! Ah, I just found some little jewels to look at. Thanks very much, I’m glad you like them! The formations are pretty wild, eh? Thanks for your comment. That’s what I suspect too. Thank you! You’ve done it again … just as FABULOUS! Thanks, Denise! The formations are pretty cool, I like seeing how they develop. So delicate they’ve disappeared. I’m sure they’ll come back again, though… Thanks, Brenda. Thanks, Polly. I think many people would prefer it not get that cold but there is a little magic that happens when it does. Your eye is so finely tuned to life’s smallest and subtlest of beauties. Thank you for sharing that vision with us in your posts. Thanks for your comment, Kari. Watching the seasons change holds lots of interest for me, I’m happy you find interest in it too. Thanks, Gwennie, they are always surprising! Absolutely beautiful, Karen. I love them all, but especially the first one. Thanks for sharing. We have had quite mild weather lately, a couple degrees above freezing, but the sun is coming back in 10 days and then it gets colder, as the wind direction shifts. Hoping for some frosty windows and ice sculptures along the coast line. Happy New Year, by the way! Thanks, Erica. Happy new year to you, too! Yes, your weather changes can be so dramatic. What a wonderful ice world! In our region the temperature is around +10°C at noon, sometimes even +15°C for weeks. I enjoy it, but normally the thermometer should be some degrees below zero. Hi Heidi, its been above 0c here that last couple of days but mostly it’s been a pretty cold winter. I like the way things look when it’s cold. Your temperatures sound pretty unusual. Impresionantes… Es Una Serie De Fotografias Muy Buena… Un Saludo. What a beautiful collection of etchings! Each one a little artistic masterpiece, and wonderful to contemplate. Indeed, those “water seeds” must have secretly been to some art school, without us knowing… Thanks for exhibiting their works to us, you’re an extremely skilled observer and curator! ciao! as amazing as an icicle. Karen, your garden is a wonderful artwork. Congratulations!!! Nature has put on another wonderful show and you have captured it for us, we who never see any frost on windows. All those little miniature art pieces in the circular framed gallery, each a work of art. Thank you for posting, Karen. This is sooo beautiful!!! this is way photography exist! So glad to see great things at this time of the day. The wonders of Nature! Absolutely breathtaking! The delicacy and detail are superb, and so magical! Absolutely lovely. The little frosty worlds that surround us if we only take the time to look, examine and honor. GREAT WORK! Beautiful! In German, these are called “Eisblumen” (ice flowers). But I haven’t seen any for years. Its a childhood memory. Most people here now have isolating windows and the “flowers” are no longer forming. However, we don’t have such extremely cold weather like North America has now (this winter, there is not even a real winter, it feels like early spring). So gorgeous and as beautiful at Snowflake Bentley’s book! Republicou isso em love sagas. Looks almost a work of obsessed craftsman isn’t it ! Wow, wow, wow. Stunning shots…youshizen says it well, the work of an obsessed craftsman (Mother Nature).
. . . makes me want to damage my windows . . . These are simply beautiful, Karen! The top one is my favorite – so delicate and the detail is unbelievable. So delicate and fragile looking. I love the gallery – it reminds me of the Glass Gallery at the Victoria & Albert Museum. Beautifully captured flora. 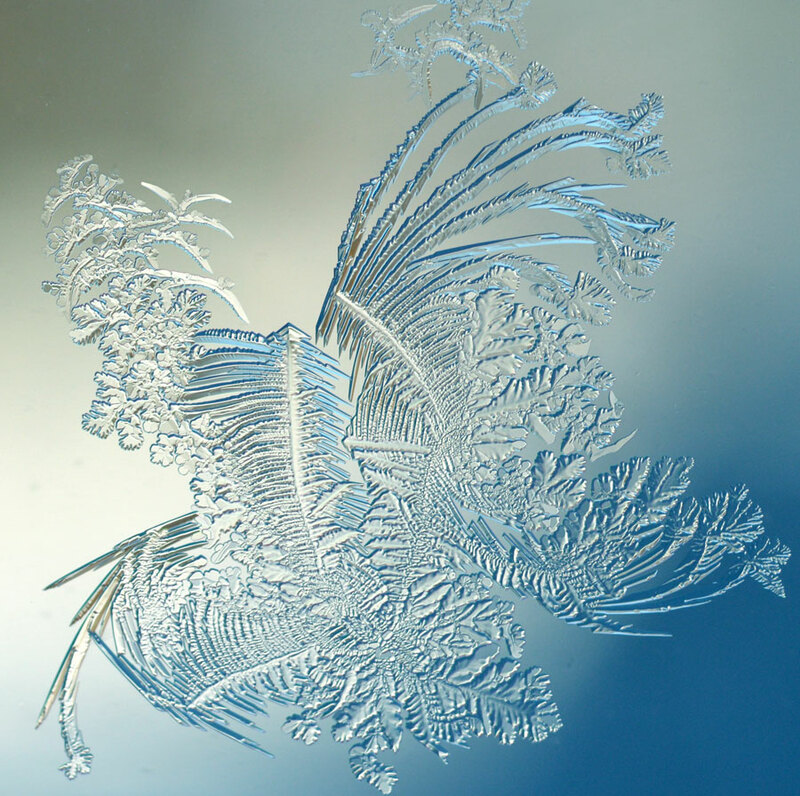 I remember these on our windows as a child — the delicate brush of Jack Frost showing us his world — a reflection of our own. I see grassy meadows and sage brush with song birds in flight, all frozen water droplets captured by your eyes, your vision, your lens. Thanks. Came across your site through wordpress. Amazing work. Please keep it up. Beautiful Karen. I like your title also. This is soooo lovely I am mesmerized! Wildly beautiful! Since you presented these with such perfectly pretty circular cropping I’m now lusting after a set of dinner plates printed with this art. Love it. Thanks for sharing! These are wonderful designs, Karen. I am jealous. Our thermal pane windows don’t frost up so I never find these designs on ours. I guess the savings in heating bills are worth it, but I miss these gorgeous patterns. Beautiful stuff. These are stunning! I especially like this post because the pictures show how my you pay attention to the details in life. I like to do that too, as it makes the world even more colorful and sparkling, but many people seem to miss out on that. Your pictures can make others see, and that is beautiful. these photos are crazy beautiful! I don’t live somewhere with cold weather, so these are amazing to me. Thank you for sharing! I’d say the frost knows a thing or two about fractals. Outstanding! Love the round ones too. Breathtaking, Karen! It’s like the tiniest garden in ice. Trees, leaves on a microscopic level. Thanks! So pretty! Just grey here, and rain… what I wouldn’t give for such gorgeously elaborate swirling frost patterns on my windows… Happy New Year to you! I hope you are well! 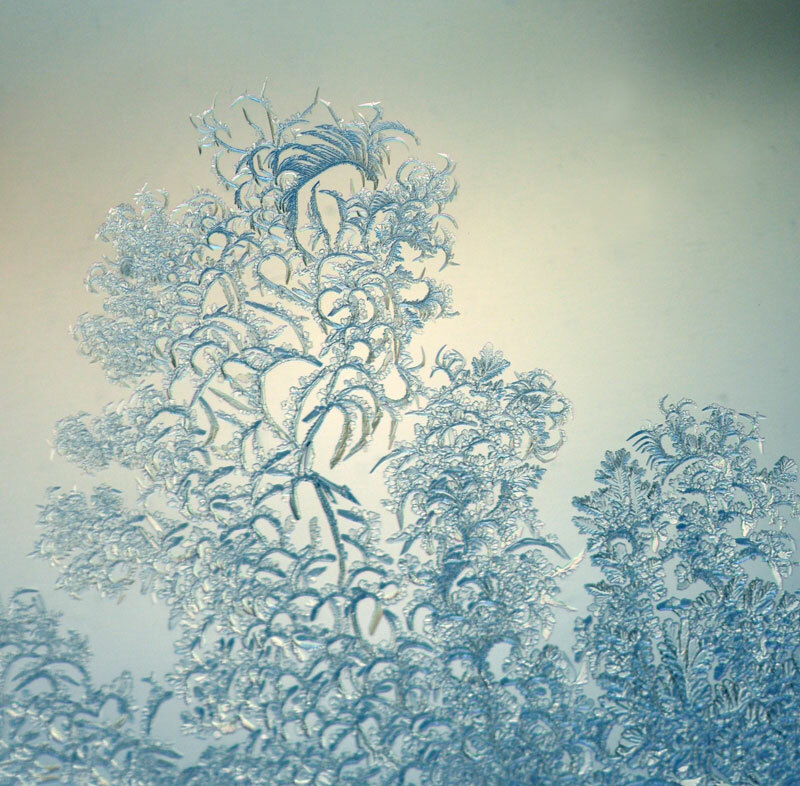 Really amazingly beautiful images of ice crystals. Pretty shapes and wonderful light. You are such a keen observer! Thanks for sharing your talent! These are so beautiful! so elegant. Ha! Nature makes amazing patterns for sure. Lalique pieces are pretty cool, though. Lots of inspiration from nature there. You’re too modest, Karen: I’ve seen a couple of other people’s attempts with these frost flora and I assure you that they were not nearly as beautiful as yours. These are amazing. All from a single drop of water? Fascinating series of images. A pleasure to see.